Chart No. 41 - A Stretch of the Occipital and Upper Dorsal [Thoracic] Region. Adjustments of the Upper Dorsals [Thoracics] By Two Methods. The neck is the etheric field of energy out of which the lower ovals and centers are formed by reflection from above. See Chart 1. From this center flow out the four rivers of energy to the lower four centers or chakras and return to it as a circuit. Therefore we find that the neck is the proverbial center that catches everything in its position as a link between the head and the body. In physiology we find that the cranial nerves reflex there, especially the pneumogastric [vagus, CN X] and its abdominal reaction. The two sympathetic ganglions also have their influence in the neck with reflexes from below. No wonder most persons are neck conscious when they are under mental-emotional tension or have indigestion of various kinds. 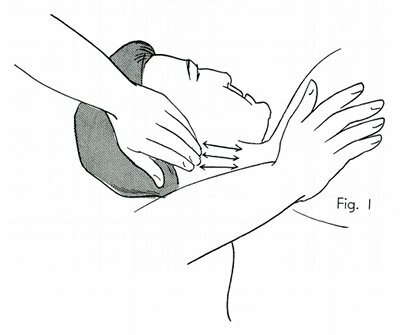 Techniques of reflex therapy which release causes of the energy blocks from below should be used first before any attempt is made to treat or to adjust the neck. Fig. 1 shows the patient lying on his stomach with the face turned to the side of the contacts. The lines of force to be influenced are shown by the arrows. The left hand is on the tender area of the occiput which has been under tension. The technicians [technician's] right hand is on the right side of the spine over the upper dorsal [thoracic] vertebrae which are the negative pole of the tension area. The two contacts are a stretch along the lines of force and the adjustment is merely a little move at the end of the stretch. There must be no rotation movement on the head. This would produce a twist in the neck muscles which is undesirable. Fig. 2 shows an elastic adjustment with the thumbs on the transverse processes of the upper dorsals [thoracics] with complete relaxation this is a unique technique in the correct direction of the lines of force and there is little hurt attached to it. A rocking directional tension release is most effective in relieving energy blocks which cause soreness and pain. The upper dorsal [thoracic] curve must be brought to the posterior before any correction for anteriority can be made. The higher the curve is placed posteriorly by bending the head forward on the chest, that much more leverage is applied to the upper six dorsal [thoracic] articulations for the correction of anteriority. When the patient is lying on the stomach a fairly firm suitable size cushion should be placed under the chest, to bring the peak of the posterior curve on the articulation where the anteriors are to be corrected by any method, in this position. For correcting rib articulations this is a good position with a firm support under the chest. It can be done without pain with the head in a split cushion - face downward.